MANILA, Philippines - The tough talking mayor of Davao City has surpassed Senator Grace Poe in the latest survey conducted by the Social Weather Stations (SWS). 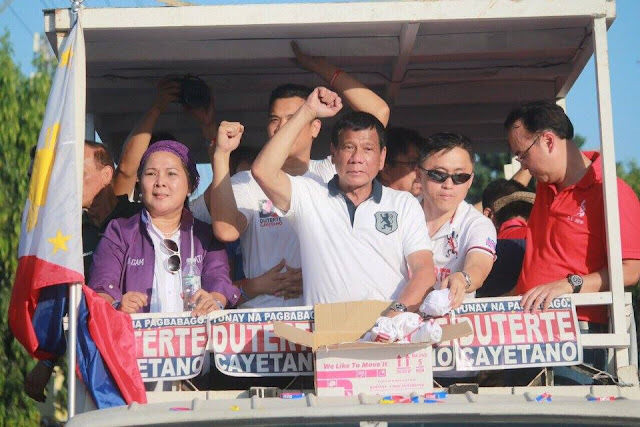 The first quarter survey conducted last March 30 to April 2016 showed that 27% of the respondents preferred Mayor Rodrigo “Digong” Duterte, who was up by four points from the last survey held in early March. The results were obtained through face-to-face interviews of 1,500 adults. Former consistent frontrunner Poe plunged to second place with 23% and is statistically tied with Vice President Jejomar “Jojo” Binay who garnered 20% of the votes. Liberal party standard bearer Manuel “Mar” Roxas II came in third place with 18%.With three percent of the votes, Senator Miriam Defensor Santiago remained at the last place. On Monday, April 11, the camp of Duterte expressed its gratitude for the favorable results of the survey. Lavina also said that informal exit polls in the overseas absentee voting proved the overwhelming support of Filipinos abroad for Duterte. According to him, the rise in support is likely the result of efforts not just by their campaign teams and candidates but also by volunteers as well as support groups in and out of the country. Still, Duterte’s campaign manager Leoncio “Jun” Evasco said their team will not be self-assured. He urged Duterte supporters to make sure the support and results of the survey will be turned into votes. "It is not over until it is over,” Evasco said. The latest scores in the Vice-Presidential race are: Bongbong Marcos 26%, Chiz Escudero 21%, Leni Robredo 19%, Alan Peter Cayetano 13%, Gringo Honasan 5% and Antonio Trillanes IV 5%. 5% of the respondents said they are still undecided. "With barely a month to go before the May polls, we take this latest news as an inspiration to persevere and work even harder in the last stretch of the campaign season," Marcos said in a statement.